I subscribed to this new delivery service, and am tickled with the first delivery, which arrived today in an insulated box, with a coldpak. 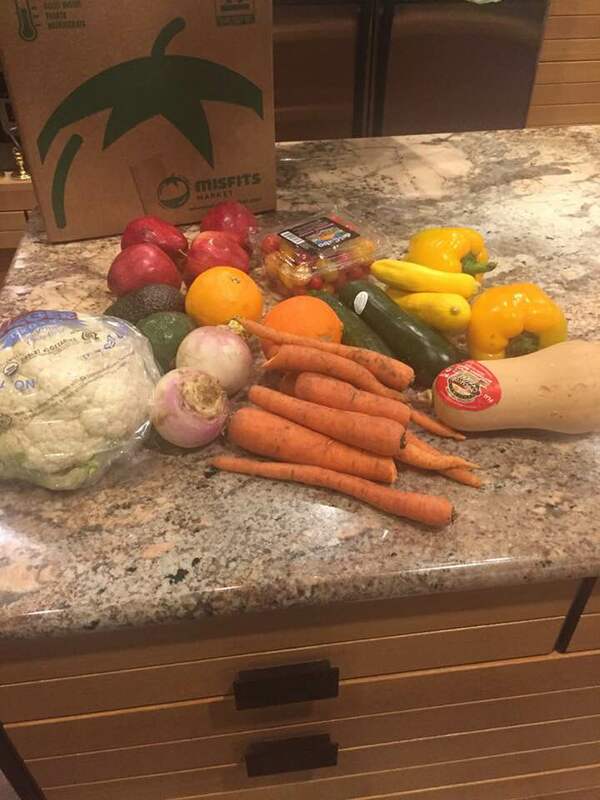 The small box is 10-12# of organic produce, for $23.50 including shipping. You choose weekly.or biweekly. A larger size is available. Nothing was bruised, nor misshapen, not that I object to the latter. I forgot to put the pint of heirloom cherry tomatoes in the picture. 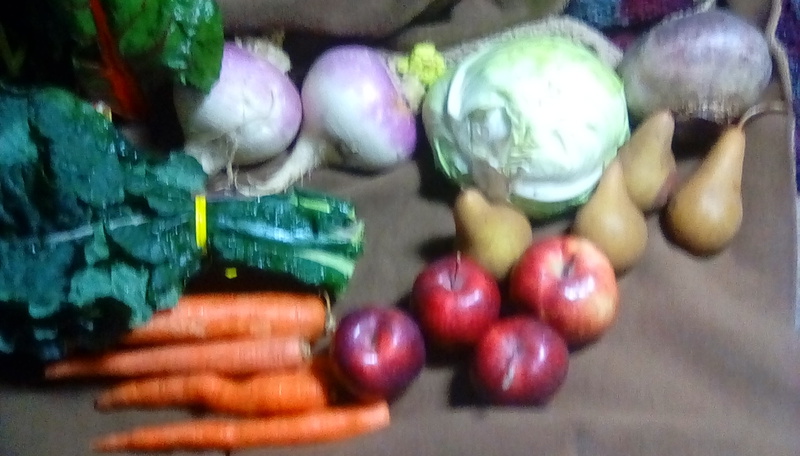 The rest is a bunch each of kale, chard, and collards, a large cabbage, 6 carrots, 4 each apples and Bosc pears, two things that are either turnips or big radishes, and, I think, a rutabaga (help?). If anyone would like a link to get 25% off their first order, you can message me on HO or FB Messenger. There’s a west coast equivalent, Imperfect Produce, that my friends in the bay area rave about but they’re not on the east coast yet. Ooh thanks for the pic! 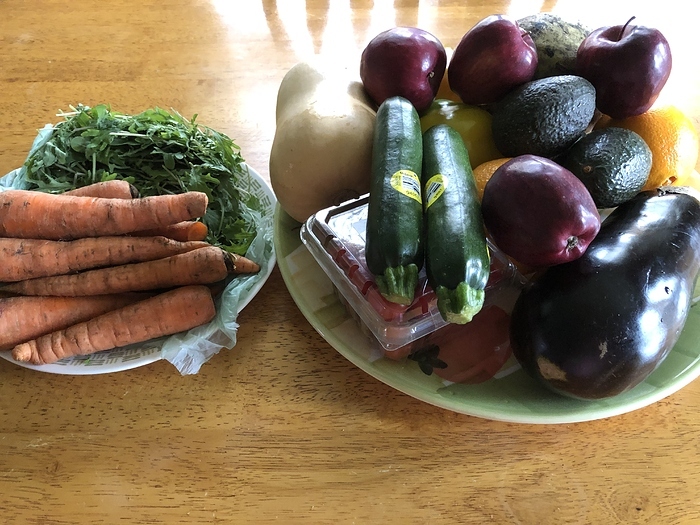 I saw an ad a while back and suggested it to friends with kids who had stopped their CSA… forgot to ask them to take a pic, but they loved it. I’m always afraid these things are too much food for me, but this looks doable, and the price is great! A few NJ HO members were discussing this service too. My wife signed up recently. Every 2 weeks as a subscriber. Next time I will take a photo of what arrives. She is pleased with the box for two. Honestly the produce didn’t appear misfit to me. She must have deleted the referral link though cause I cant find it. Maybe if I contacted HQ they can resend. I hope MM takes off like a rocket! 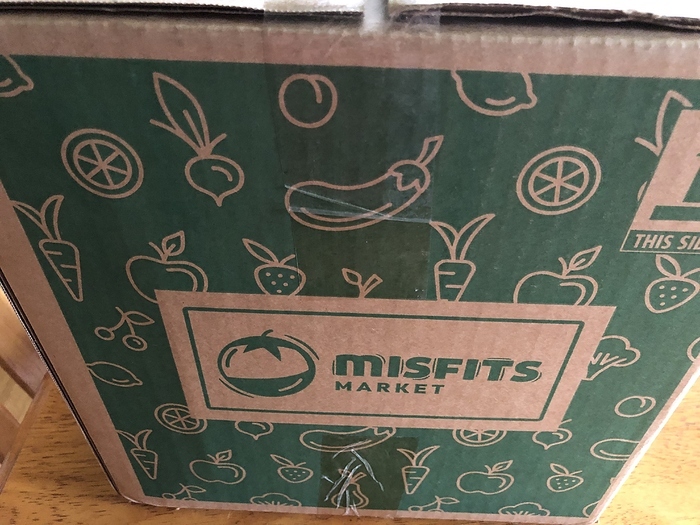 Our Misfit Markets box arrived today. My first time opening it with my wife out of town. 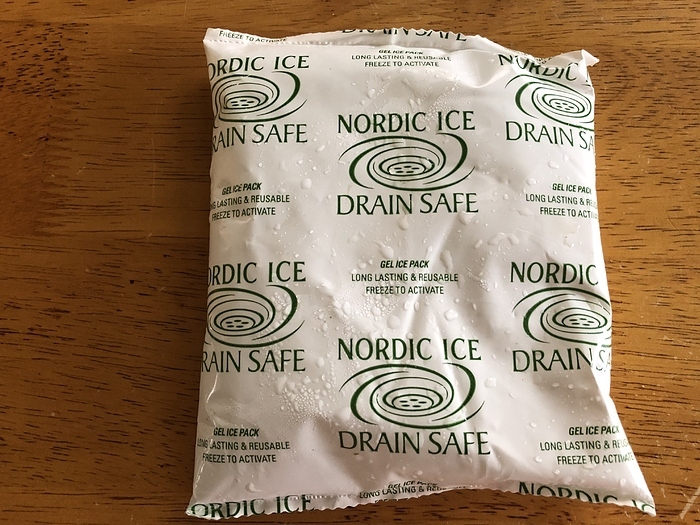 The box is well insulated, one ice pack that arrived cold but defrosted by the time it reached my door in NJ from the distribution ctr in Philly. Today the mystery included the largest yellow beet I have ever seen currently roasting along with the carrots that arrived. The small bagged bunch of arugula was a tad wilted and dusty but a quick salad spinner ride refreshed the leaves in no time. A few of the CA baby tomatoes were mushy but mostly in tact. The rest of the bounty was in great shape. An outstanding value. Yours seems to have paper insulation. Mine had a corn foam sandwiched between recyclable plastic, so only the coldpak isn’t recyclable/compostable. Of course, it can be reused. I do see the advantages. It just me. I have to shuffle through the canned goods to pick the best . If you read through the site’s FAQS and blog, it says not everything is misshapen. They explain scenarios by which they acquire first-quality produce for which sales or delivery fell through. I’m pleased. I roasted the carrots and gigantic yellow beet. Cleaned up the rest as needed. Yes the insulation was paper. My town will take it with the rest of the recycled stuff. Everything was packaged well. We have the every two week delivery since we also shop for produce locally. I really like the idea of saving these perfectly good produce items from the trash heap. The avocados arent even ripe yet. 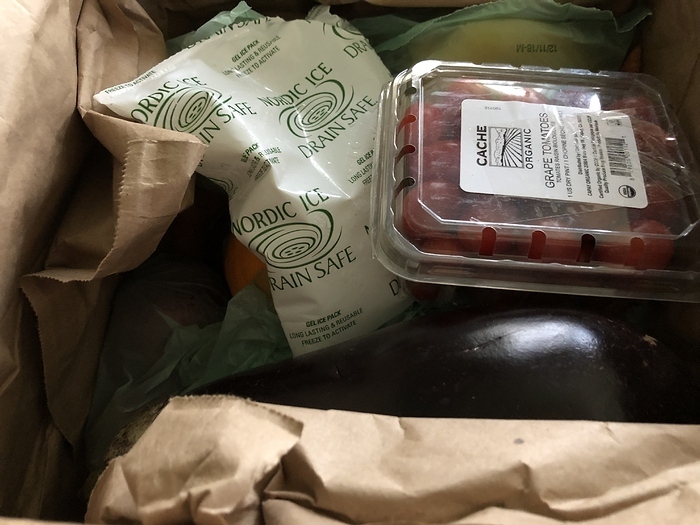 Since I consume alot of produce every week, like the prep aspect and can receive the box within a day, I’m sold for now. Okay, so at this point, I juiced the oranges to enjoy with breakfast. Roasted yellow beets, carrots, eggplant, zukes, yellow peppers and my own onions for a veg soup. I made a small patch of applesauce with the apples and added roasted pears to the blend. I have probably 3 salads worth of arugula, one small butternut squash and three avocados still rippening on the window sill. Unfortunately, the small tomatoes are very sour tasting so those were composted. But, I am glad to be participating in the produce service. I hope the variety from delivery to delivery is good. I’m not sure I would enjoy receiving the same items too many times in a row. I wonder if the distributor keeps track of that sort of thing. From reading through most of the FAQ and blog, it seems like they do. It would.hurt their business if deliveries were monotonous. But, like a CSA, they are limited by what produce is available any given week. You probably won’t see winter squash much longer, and I don’t expect berries in January. Makes sense, I hope MM agrees. Anyone know if misfits has a way to exclude certain items? I noticed that Imperfect Produce allows you to “customize” a bit before delivery. I usually freeze tomatoes that are too sour or getting squishy, for use in cooking later.